Woodworking Workshop: From anxiety to “easy-peasy”! Last Saturday, a group of MBIS eagles gathered to learn or continue learning their carpentry skills. 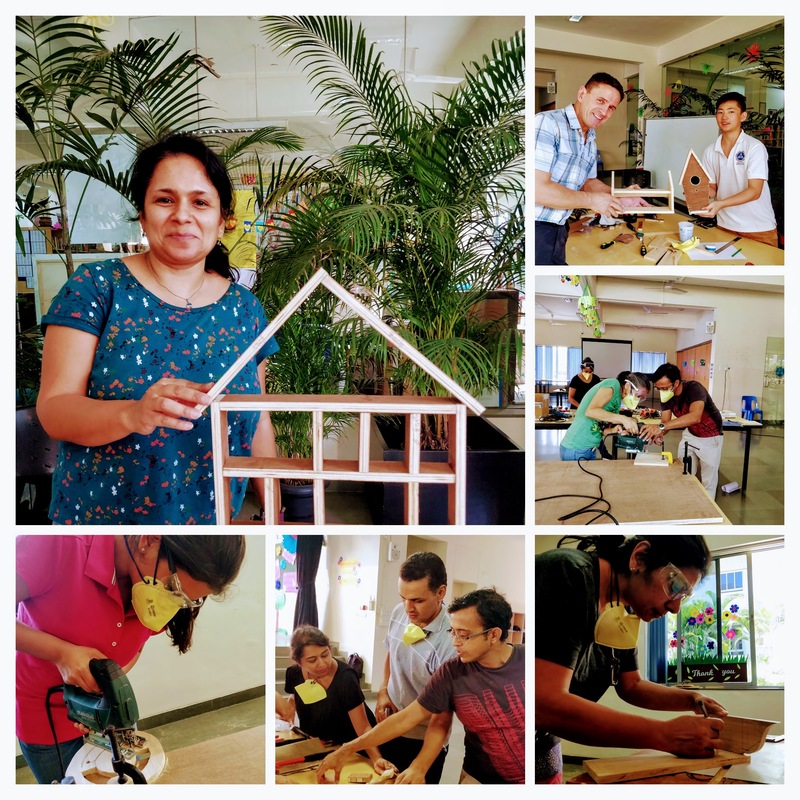 We were guided by Deepak Mulajkar, professional woodworking trainer and his assistant Siddharth Pathak to create, collaborate, troubleshoot and express ourselves with wood! Many of the new participants were scared to start with, however, the anxiety slowly faded and we could feel the creative atmosphere buzzing! All participants created a few projects including one with their own design. But let’s hear the testimonies of our participants! Made me feel empowered to learn a new skill and confident to explore the world of woodwork (which I didn’t expect!) ~ Ms. Kruti V.
Rewarding, fun, hands-on. ~ Ms. Teresa Rodríguez-B. I could use power tools in a safe environment with guidance which made me feel more confident and which helped me overcome my fear of some of the tools. I really liked to use the jigsaw and challenge myself with curvy designs. It was an opportunity to be entirely present, feel myself learning and be part of a team of makers that shares a tinkering and iterative mindset. Very fulfilling! ~ Ms. Fanny Passeport. It was great! There a lot of scope for the skills development for everyone. ~ Mr. Praveen Sharma. As empowered learners, the workshop supported us in exploring new hands-on skills as well as approaches to learning, in particular collaboration, organization and creative thinking. We wish to conduct this workshop again in the future for more eagles to fly with us! Dis-moi dix mots Elements of the PYP Exhibition that have taken place over the past week.